So, what is the intrepid Adrian up to? Last week, we heard from Adrian Ristow, an independent contractor now working with Coca-cola in Africa, doing some on-the-ground research into what makes local distribution models work. He's now going to look at whether there is mileage in our idea to distribute rehydration salts as part of his work, as the research in the field gets underway. Here he explains the model that Coca-Cola is interested in, and how the programme came about. 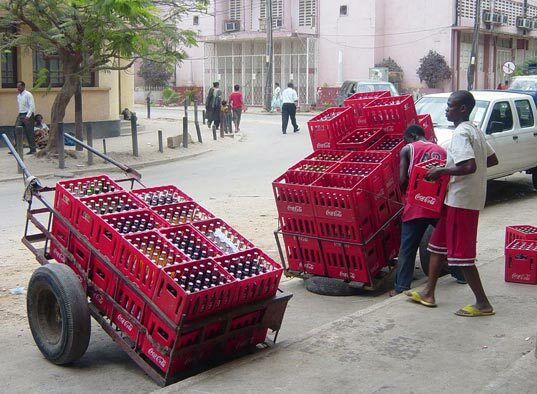 "Over the last year or so, Coca-Cola became interested in a model for local distribution based on the work of Coca-Cola Sabco and some other bottlers in Africa. This model is known as the Manual Distribution Centre (MDC) model. Seeing that it had a lot of potential, Coca-Cola wanted to understand how it works, what makes it successful, and what promise it might offer. Our ultimate goal is to build an enhanced and replicable model that supports the commitment to the Business Call to Action. Big ideas - but it all starts with small steps, some real understanding of what works locally, and lots of involvement from the people that really matter: the local communities, the local businesses, and their customers. We've decided to research the model with a specific focus on its socio-economic impact. In other words, what difference is it really making to how people earn and live? Tanzania was chosen as the research and pilot market, and I'll be reporting to you from there shortly. Tanzania specifically. We have just entered into a partnership with the Corporate Social Responsibility Initiative at the Kennedy School of Government at Harvard (download PDF), as well as with the International Finance Corporation. This will help us to complete a more structured research process and to bring in an independent perspective. As we speak the core data collection phase is taking place, and I will bring you more stories from the front line as I gain more insights." The research into Coca-Cola's distribution network in Ethopia and Tanzania, first mentioned here, is now underway and Adrian is the man on the ground. Despite the inevitable connectivity issues that we will face, Adrian has undertaken to keep a dialogue going on the work he is doing and the people he meets. 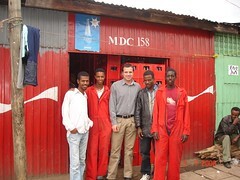 This picture was taken on 3/7/08 when Adrian visted Mubarek, a distribution centre owner and his team in Addis Ababa. As things turned out, their needs and my passion overlapped and together we identified a project focused on an innovative distribution system, called the Manual Distribution Centre (MDC) System, being utilised by Coca-Cola Sabco and some other bottlers in Africa as something to pursue. I was, therefore, appointed as an independent contractor to manage the project from earlier this year. I will be passing on any comments received here and on the Facebook Group to Adrian.